He’ll lead East Carolina as its interim coach in Saturday’s trip to North Carolina State in what has already been a difficult season, and it comes just two days after the school fired third-year head coach Scottie Montgomery. That left very little time for ECU’s players to process the news of Montgomery’s ouster after going 9-26 in his tenure. That only adds to the challenge facing the Pirates (3-8), who visit an eight-win Atlantic Coast Conference team in a game added to the schedule for both schools to replace games canceled due to Hurricane Florence in September. The Pirates, who went 1-7 in the American Athletic Conference, were supposed to visit Virginia Tech on Sept. 15 though they canceled the trip due to travel concerns as Florence bore down on the Carolinas and Virginia. As for the Wolfpack (8-3), Dave Doeren’s squad was scheduled to host a ranked West Virginia team in the marquee game on the nonconference schedule. The two schools got together and announced Oct. 2 that they would meet Saturday in Raleigh provided it didn’t conflict with a league championship game for either side. Doeren’s program has won 17 games in the past two seasons and has a chance at only the second 10-win season in program history by winning this one and a bowl game. 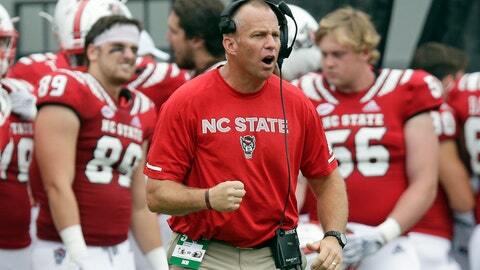 N.C. State won 52-10 at Louisville on Nov. 17 in the Cardinals’ first game since the firing of Bobby Petrino. Then the Wolfpack won in overtime at UNC last weekend, leading to the ouster of Tar Heels coach Larry Fedora the following day. And now comes East Carolina.